Make no mistake about what went on yesterday with the shocking tweet in which President Trump appeared to attack members of the Freedom Caucus, some of his earliest and staunchest supporters in Congress. It is not about a policy difference over getting rid of Obamacare – it is about White House Chief of Staff Reince Priebus and his home state buddy House Speaker Paul Ryan saving their jobs. Priebus is clearly out of his depth as White House Chief of Staff. His only real qualification for the job is his relationship with Speaker Ryan and after the Ryancare debacle in which the President was drawn into supporting a bill something like 100 members of the House Republican Conference were prepared to vote against Priebus’ job was on the line. When the Ryancare – or RINOcare bill as we prefer to call it – blew up Washington was abuzz with the rumor that Ryan was on his way out as Speaker. Republican officials in Congress and the White House were openly discussing finding a GOP replacement to Paul Ryan as Speaker of the House, after Ryan failed to pass the American Health Care Act out of the House and misled the public and President Donald Trump when he promised repeatedly the bill would pass. Our friend Matthew Boyle of Breitbart reported many allies of the president and several White House officials over the weeks since have confirmed to Breitbart News that the president is concerned that Ryan may not have his—or his agenda’s—best interests at heart. Ryan’s failure to deliver the votes on healthcare cement Trump’s skepticism of Ryan, they say. White House sources tell Breitbart News that the president is very frustrated with Ryan and feels that he has saved him multiple times already. After the election in November, it was widely reported that there were enough Republican votes to remove Ryan as Speaker—and the only reason conservatives kept him is that Trump won the election and embraced Ryan. But now Trump may perceive Ryan as a burden rather than someone who can help enact his agenda reported Boyle. What’s changed in the last week? Absolutely nothing, except that Ryan and Priebus are now desperate to save their jobs and to do that they need a scapegoat for their failure. Thus, the attack on the Freedom Caucus. Freedom Caucus Chairman Rep. Mark Meadows (NC-11) told The Washington Examiner "The narrative is not surprising in the White House because I think some of his [President Trump’s] advisers are suggesting that it was consensus that we pulled the rug out from underneath the president's agenda and nothing could be further from the truth… But that being said, I don't take it personally." Former Freedom Caucus Chairman Rep. Jim Jordan also downplayed the fight by saying there's still time to make changes to the bill that he said would help "fix" the legislation so it does what Republicans promised to do: change the bill in a way that lowers premiums for people. "All we're trying to do is fix the legislation," Jordan said. "The whole world thinks, 'oh, because a bill got postponed, this town is going crazy, the sky is going to fall.' It's not. Let's just fix it and quit worrying about tweets and statements and blame and let's focus on the actual document." Representatives Meadows and Jordan, two limited government constitutional conservative heroes, are right. This battle that has been ginned-up between the President and conservatives isn’t about accomplishing the President’s policy – it is about Speaker Ryan and White House Chief of Staff Paul Ryan saving their jobs. It’s time for the President to change the password on his Twitter account and focus his efforts on fulfilling his promise to pass a bill that will actually do what Ryancare never will – lower premiums for the forgotten Americans the Freedom Caucus represents. Both Priebus and Ryan should be out. Submitted by Arizona Don on Sat, 04/01/2017 - 11:02. There is little doubt neither Priebus or Ryan are an asset to President Donald J Trump. There is also little doubt they are “not” working toward helping President Trump to fulfill his campaign promises. Seems to me they have both just demonstrated this to the nation. They like McCain and Graham are liabilities. However, at the same time I am not of the thinking that Ryancare should have been passed by the House of Representatives. It is true the final bill would have looked nothing like Ryancare however, it should at first “repeal” the ACA. It did not. Nothing can fix obamacare unless it at first is repealed completely. It cannot help to be common knowledge Paul Ryan refused for some time to support now president Trump even after he was declared the primary winner. For that matter even after he won the presidency. One of the responsibilities of a speaker is to organize the members of the house behind the candidate (or now president) of your party. He may have later done it somewhat but it was reluctantly and half heartedly at best. Consequently, Ryan may actually be a RINO. He is certainly no more conservative then John McCain. 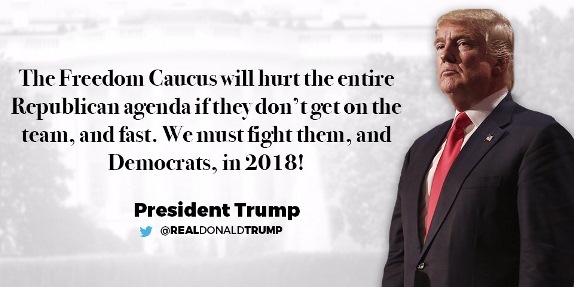 The democrats will not give President Trump a chance because he has them scared to death that he will, and intends to, keep the promises he made during his campaign for president. If he does that he will win again in 2020. In my opinion President Trump has already done more for America in two months than obama did in eight years. However, obama did excel at two things we all have to admit. Vacations and lies. He is number one in both cases. The title of worst president ever in the history of the United States of America was certainly earned and deserved by obama! Submitted by email_registrat... on Fri, 03/31/2017 - 14:04. I was very surprised when President Trump appointed Preibus as his Chief of Staff as he was very much against Trump all during the campaign. The same goes for ryan. Neither one of them is to be trusted as they are both part of the cesspool (swamp) that Trump needs to drain. He needs to start with those two, comey and many others left over from the obama reign. That needs to be the top priority until Trump can be assured he is surrounded by allies, not enemies. Submitted by email_registrat... on Fri, 03/31/2017 - 12:52. Your article hits home. It is well known that Ryan is an establishment & donor class sycophant. Priebus has shown himself to be another contributor to the internationalists power brokers. Neither Ryan or Priebus have any love or consideration for President Trump. They are in politics for their own self aggrandizement. The fact that Ryan kept the bill under wraps, wouldn't allow amendments and lied to the President that he had the votes to pass what most people consider the Republican re-election killer of all times should preclude him from continuing as House Speaker. I hope the President and the House will read and take your comments seriously. God Save The Republic. Submitted by AFpX8txfhv on Fri, 03/31/2017 - 11:12. Paul Ryan should never been elected Speaker in the first place. members persuade him. (Not a quote, but pretty close). I wondered at the time, why would they have ever elected him. Now we certainly know!!!! Yes - he should be replaced - quickly. Louis Gourmett (sp?-sorry) should never have left consideration. Submitted by email_registrat... on Fri, 03/31/2017 - 13:33. I totally with Skua. Well said.